Eyeing the HTC Thunderbolt or EVO 4G with envy but stuck on AT&T? Fortunately, the carrier, which has a long reputation of not embracing Android (none of their Android phones can officially sideload apps) has just announced its next "superphone." 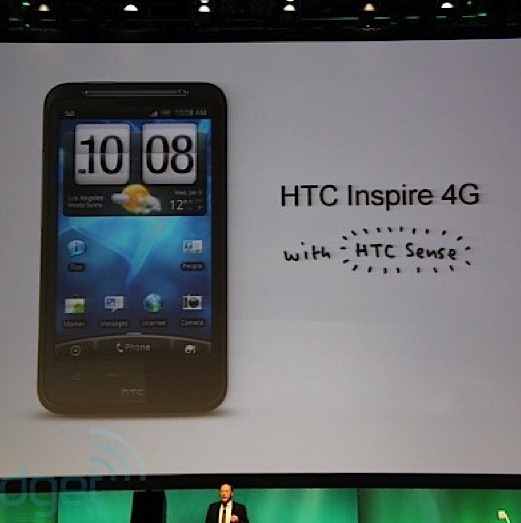 The HTC Inspire 4G looks to be just about the same as the Thunderbolt, with a 4.3" screen and 4G connectivity, although it will support AT&T's HSPA+ network instead of their upcoming LTE network. Also worth noting is that this device will launch with the latest Sense UI, the same as we've seen on the Desire HD and Desire Z abroad, which will allow access to HTCSense.com as well as extra features such as offline maps and fastboot.